Neil Cornrich & NC Sports, LLC: Saints' Payton calls Dallas Clark Colts' "best player"
Saints' Payton calls Dallas Clark Colts' "best player"
From Gregg Rosenthal's "Payton to Porter before pick: Watch the shot"
* Payton to Mike Bell after he slips near the goal line. "What kind of shoes you got on?!" (Bell shows him.) "That f--king figures. Put on the cleats!" * Scott Fujita walked up to Peyton Manning before the Colts' final drive of the first half: "Why don't you throw us a few?" * Smith on Dallas Clark: "I'm jamming him and he's still catching the f--king ball." 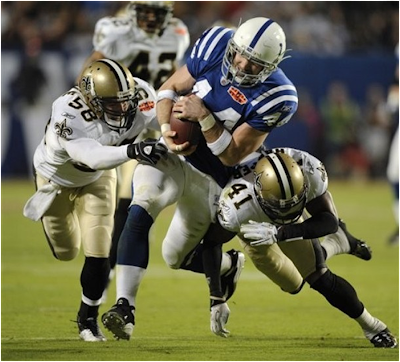 * Payton to linebacker coach Joe Vitt: "Dallas Clark has about 149 yards now. Let's not let their best player beat us. That's a sin." * Fujita to Lance Moore after his two-point conversion play was overturned: "Good job buddy. You went from an a-hole to hero in about 30 seconds."